Syria’s official state news agency SANA said Israel targeted a military site in the area, but that Syrian air defenses intercepted the attack, downing some of the missile fired. The regime mouthpiece said the interception resulted in the destruction of several buildings and the wounding of three “fighters.” The area is known to house Iranian forces and their Lebanese proxy, Hezbollah. Iran has been one of the top military backers of Syrian President Bashar Assad’s regime in the over nine-year-long civil war in the country, as has been its Lebanese proxy, the Hezbollah terror group. 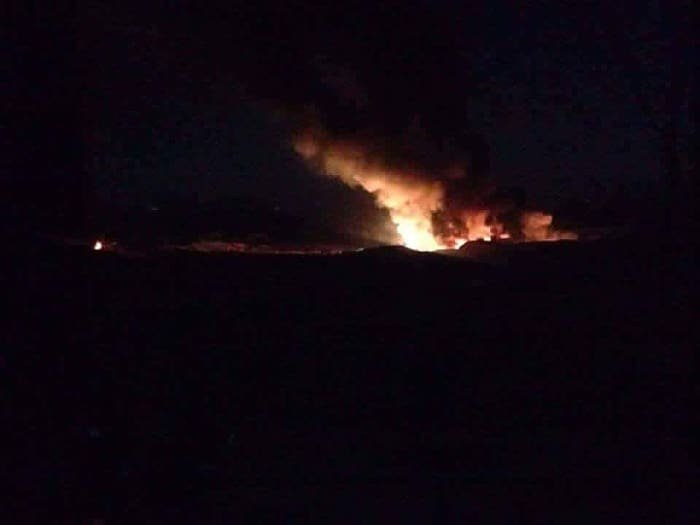 SANA quoted a military source as saying on Saturday, “Around 2:30 am (2330 GMT Friday)… the Israeli air force carried out a strike targeting one of our military positions in the town of Masyaf,” adding that Syrian air defenses intercepted some of the missiles. “The enemy missiles were dealt with and some of them were shot down before reaching their target, resulting in the damage of a few buildings and the injury of three fighters,” SANA said, according to a Reuters report. Earlier, SANA had reported explosions in the area’s countryside. Israel is said to have previously struck the area near Masyaf, home to a Syrian scientific research center. Western officials have long associated the Scientific Studies and Research Center near Masyaf, known as CERS, with the manufacture of chemical arms. In July last year, Israeli jets reportedly targeted a missile production facility in Masyaf, where a leading Syrian chemical weapons and missile scientist was killed earlier that month in a car bombing attributed to Israel. In September 2018, satellite photos published by an Israeli intelligence firm purported to show the establishment of an Iranian surface-to-surface missile factory in the area of Wadi al-Uyun, near Masyaf. The photos, which were shared by ImageSat International, were said to show a facility resembling Iran’s Parchin facility, which has been linked to the Islamic Republic’s ballistic missile and nuclear programs. The site was likely not targeted due to its close proximity to a Russian S-400 anti-aircraft battery, which is considered to be one of the most advanced air defense systems in the world. In February, ImageSat International said Syria’s powerful S-300 air defense system was “probably operational” in the area of Masyaf. The system would pose a potential threat to Israel’s aerial campaign against Iran in the country. The firm based this assessment on multiple images of the anti-aircraft battery, which showed three of its four launchers in a raised position, signaling that they are likely ready to be used by the Syrian military. Israel has threatened to destroy the S-300 system if it is used against its fighter jets, regardless of the potential blowback Jerusalem would face from Russia, which provided Syria with the powerful air defense battery. Last month, Israel allegedly attacked Iranian targets near the northern city of Aleppo. SANA said at the time that the airstrike targeted several bases near an industrial zone by the airport and that air defenses had managed to intercept several incoming missiles. Acting Foreign Minister Israel Katz appeared to confirm last month’s attack, saying in an interview with Israel Radio late last month that “as far as Iran knows, it’s Israel” that carried out the strike, and went on to say that it was a “challenging” operation. The strikes come at a time of heightened tensions between Israel and Syria, following last month’s decision by the US administration to recognize Israel’s control over the Golan Heights it captured from Syria in 1967. The decision sparked condemnation and protests in Syria. Israel in recent years has carried out hundreds of airstrikes in Syria against targets linked to Iran and Hezbollah. This entry was posted on April 13, 2019 at 12:40 PM and is filed under Uncategorized. You can subscribe via RSS 2.0 feed to this post's comments. You can skip to the end and leave a response. Pinging is currently not allowed.